Readers of the Toronto Injury Lawyer Blog have asked for quick, easy to understand answers to their legal, personal injury related questions. We try to do this every week, but this week, we’re going to do something a bit different. Instead of focusing on one or two topics, or recent developments in the law; we’re going to give you a rapid fire Q & A with our directing lawyer, Brian Goldfinger (BG). We hope you get something out of this rapid fire question and answer series. If it’s a success, we’ll try to do it more often. Q: What sort of cases does your law firm handle? BG: We handle a wide variety of personal injury claims and insurance disputes. From catastrophic car accidents, brain injuries, motorcycle accidents, long term disability claims to dog bite claims; we handle them. Basically, if you’ve hurt or injured, our law firm can find a way to help you out if you have a cause of action and a valid claim. Q: Does your law firm practice in any other areas of law aside from personal injury claims? BG: No. We focus on in injury claims, and that’s pretty much all we do. Any legal matters for wills, estates, business law, criminal law, family law etc. all gets referred to my colleagues who focus on on those areas of the law. Q: It all comes down to money, and our readers want to know how much it costs to meet with you. BG: Meeting with me is FREE! Q: But how much does it cost after the free meeting? There’s gotta be a catch. BG: There’s NO COST after our free consultation. If we like you, and we like your case, then we will take your case on what’s called a “contingency fee basis”. This is a fancy legal term for you don’t have to pay any legal fees until your case settles. That means you pay legal fees at the end of the case, and the legal fees are contingent upon our recovery for you in your case. Q: Our readers are always concerned about legal fees. What happens if you don’t get any money in the case? Will we owe you lots of money? BG: No you won’t. Our law firm wasn’t built on screwing people out of their hard earned dollars after they’ve been injured in an accident. At the end of the day, if we don’t get you paid, then you don’t have to pay any legal fees. In even more simple terms, if we recover ZERO for your case, then we get ZERO. I can’t make it more simple than that. Q: That’s good to know. How long does it take for my case to settle? BG: It all depends on the nature of your case, the nature of your injuries, and who’s on the other side of your claim. Every case is different, and the life span of every case is different. Some cases settle in under a year, and other cases take longer 1+ to 4 years to settle. It all really depends on the facts and nature of your case. Many of the things which contribute to settlement such as how fast you recover, the position of the insurer, any insurance coverage issues, or delay with the Courts are outside of our control. Q: What is the likelihood of my case going to trial? BG: 99% of civil cases such as personal injury and long term disability cases settle outside of the Courtroom without ever going to trial. Q: What’s required of me during the case? BG: The only thing that we ask of our clients is that they focus on their wellness and rehabilitation. Let us take care of the rest. Litigation can be stressful, complicated and lengthy. It’s not your job to worry about those details. That’s why you need to retain an experienced, confident and skillful lawyer to handle your claim. Let us take care of those nitty gritty details and you just focus on getting better. Q: I’ve read online about examinations for discovery. What’s that all about? BG: An examination for discovery is the same thing as a deposition in the United States. You might have seen a deposition or two on legal TV shows (Suits, Law & Order, etc.). Basically, the lawyer for the insurance company meets with me and you in a board room. The lawyer from the insurance company asks me questions about the who, what, where, when and why about the case and how the accident has impacted your life. The answers are recorded by a tape recorder. All you need to do at the examination for discovery is to answer truthfully. Don’t lie. Don’t guess. Don’t make up stories. Just tell the truth and everyone will be alright. The Examination For Discovery is the only part of the case (aside from trial) where the lawyer for the insurance company gets to see you face to face and ask you questions. If you follow those simple rules of not lying, guessing or making things up, then you will do just fine. Q: What is a mediation? BG: Mediation is a confidential settlement meeting where the parties get together and try to settle the case with the help of a neutral, third party mediator. If all goes well at the end of the mediation, the case will be settled. Q: Do cases have to settle at mediation? BG: Cases can settle at any time. They can settle via email, phone call, letter, fax, smoke signal etc. Mediation is just a process (like a legal tool) to bring the parties closer to settlement, or actually settle the case. Q: Is it legal for the insurance company to follow me with surveillance and private investigators? BG: Unfortunately, this is perfectly legal. It’s not legal that they harass you, but they’re allowed to do their job and collect surveillance of you in an attempt to show you doing something you shouldn’t be doing. A lot of surveillance these days is not being conducted in the traditional Dragnet sense. Many investigators are turning to the internet. Q: What is the difference between a paralegal and a lawyer? BG: Lawyers are lawyers. Paralegals are not. The training for lawyers is different than the training for paralegals. Paralegals cannot sue in Superior Court; nor can they sue for amounts over $25,000. Paralegals cannot appear before the Superior Court, Divisional Court, Federal Court or Court of Appael. They are capped at suing for $25,000. Lawyers can sue in ANY Court, can seek declaratory relief against insurers (like a declaration that an injured party is entitled to catastrophic benefits or long term disability benefits) and can sue for ANY amount. There is certainly a place for paralegals, but I would not recommend using one if you’ve been seriously injured. Q: I live in a remote part of Ontario. Can you still help me? BG: Yes. We represent clients across Ontario. Even if you aren’t near one of our offices in Toronto, London or Peterborough, we would still be happy to meet with you and help you out. So long as you’re in Ontario, we can help. If that means driving or flying out to meet with you at your home in a remote part of Ontario, we would be pleased to do so. Now with the power of the internet, the province has become that much smaller. 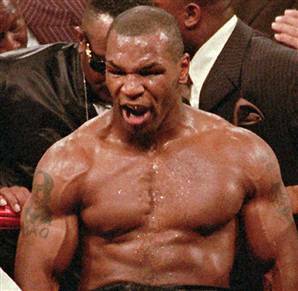 Q: Did you see the Mike Tyson interview today on CP24, and if so, what are your thoughts? BG: Yes I saw the interview. I was impressed by the CP24 news anchor’s calm demeanour and ability to keep his cool when faced by a pretty scary man.